I’ll have the poached eggs and toast, please! Poor pan is showing it’s age. I probably fell for it because it has a bright red edge. I’m embarrassed to admit it, but I wasn’t sure exactly how to use it. Of course, there’s no excuse for cluelessness when you can find bajillions of explanations on the interwebs in a tenth of a nanosecond. It’s about as hard as boiling water. Game on! The back side is a completely different color and a little worse for wear. But hey, we’re not going to discuss how YOUR backside looks. The tricky part was finding a pot in the same diameter in my cupboard. My skillets were too wide, so I settled for a slightly smaller pot. In a perfect world I would have a matching graniteware pan with a matching graniteware lid, hopefully with a modicum of chips. 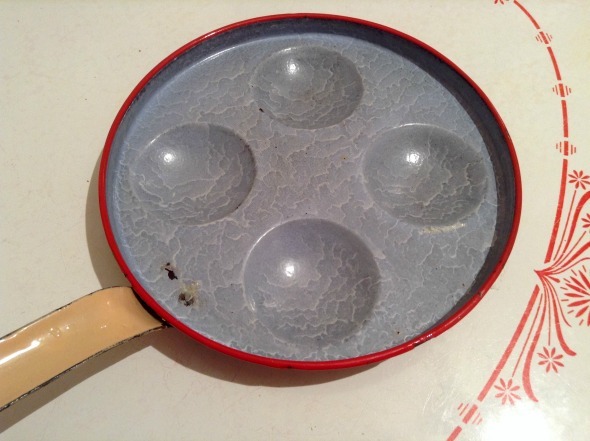 Back to real life: I heated a couple inches of water to boiling, put the poacher pan on top and sprayed the egg wells with nonstick stuff. The handle ends in a handy little tab that hooks over the edge of a pot. It worked great. Size really DOES matter. I guess vintage chickens laid smaller eggs, because these modern super-size babies spread all over the place. Good thing the surface was all coated with nonsticky spray stuff! Ooopsie! 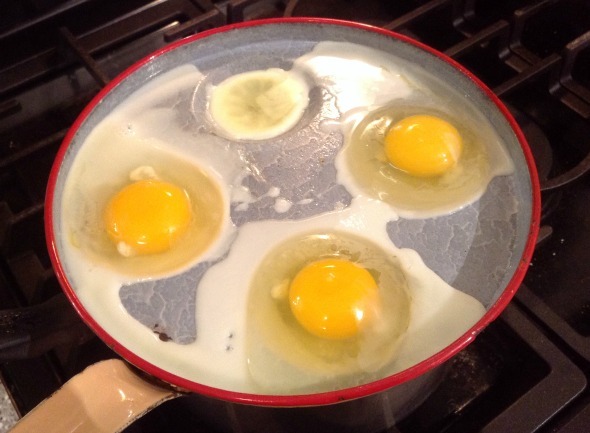 Egg overflow! 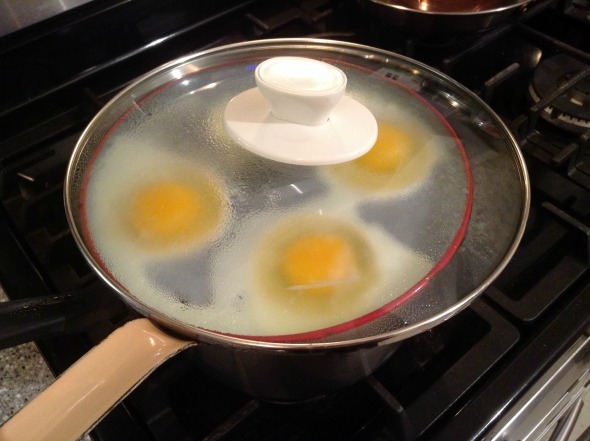 Extra large eggs are WAY too big for the little egg wells. 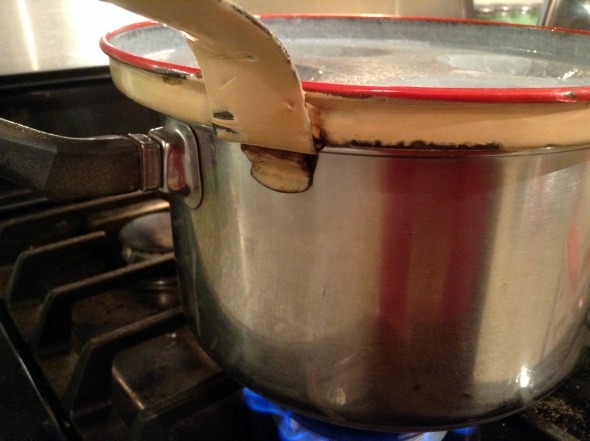 I didn’t have a pot lid that fit exactly. I had to improvise with my glass crockpot lid. Lid size doesn’t matter as much as transparency. At least I could see the egg whites cooking. I’m not sure how long I let them steam. 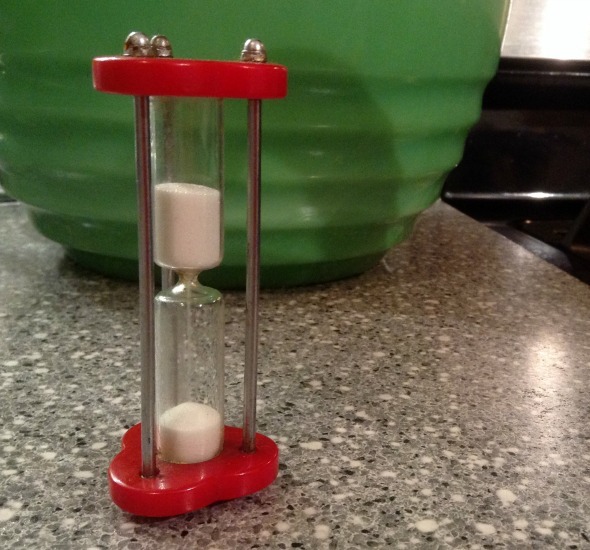 I pulled out my vintage egg timer and let’er rip. Red Bakelite cuteness and usefulness in one 3″ tall package. Time to pop some bread in the toaster. 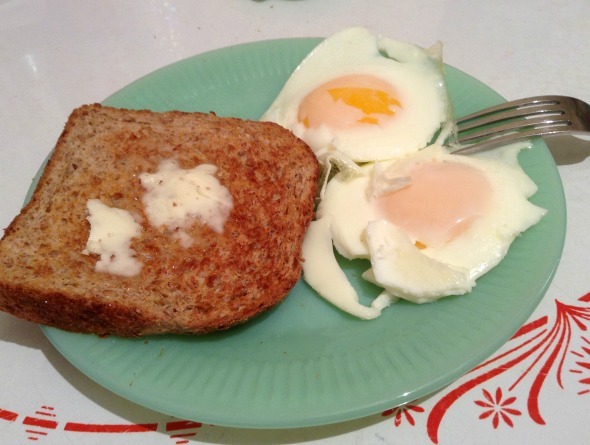 With any luck the toast and eggs will get done at the same time. Chrome and red tick all the right boxes. 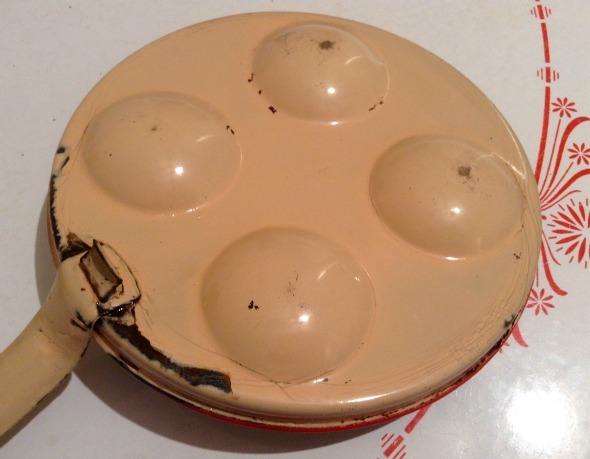 Too bad Kenmore doesn’t make ’em like this anymore. Success! 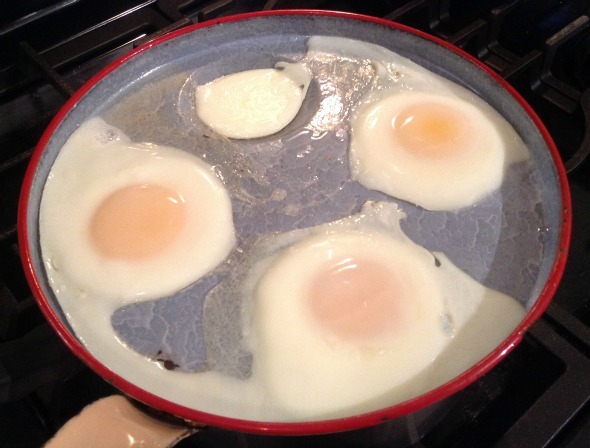 The yolks are just a bit runny and the whites are set. Ta da! Poached to imperfection, including the sad little blob of solid egg whites. For once I got to sit down and enjoy having a plate and fork instead of peanut butter toast in a napkin in the car on the way to work. A “beauty shot” right before I jabbed the yolks and made a gooey mess. 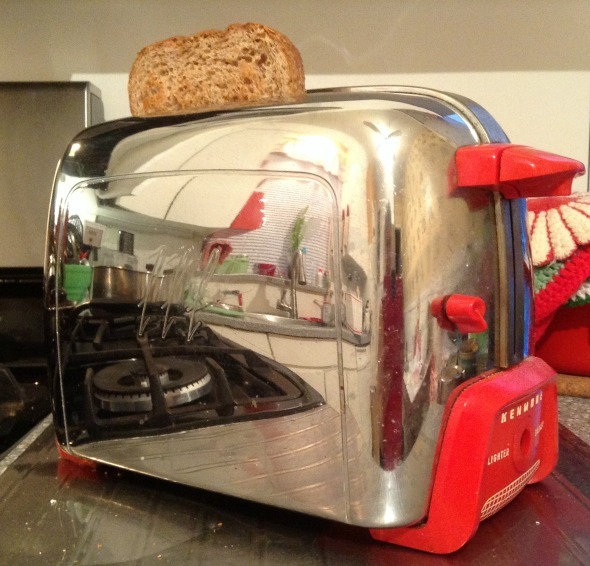 I love the jadeite and red bits of your kitchen reflected in the toaster!